Kandidatorientering, November 1, 2010 Algorithms and Data Structures. 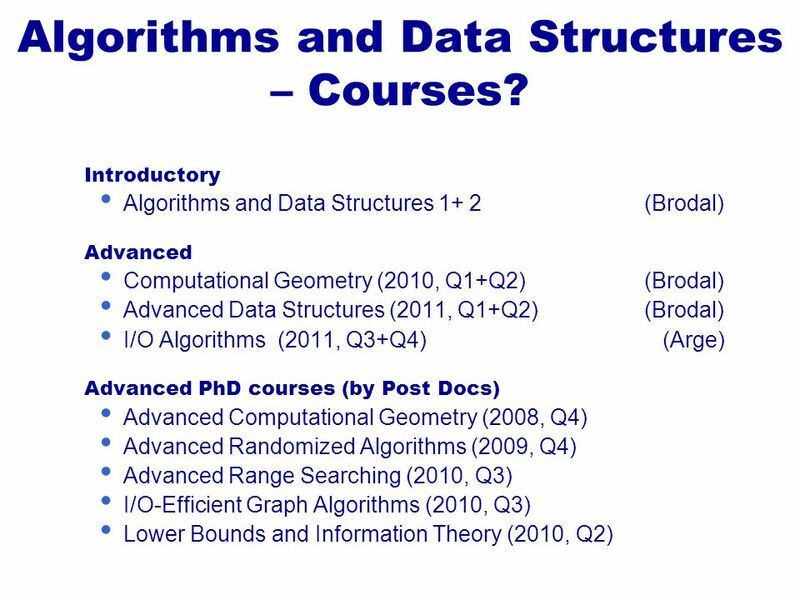 4 Introductory Algorithms and Data Structures 1+ 2(Brodal) Advanced Computational Geometry (2010, Q1+Q2)(Brodal) Advanced Data Structures (2011, Q1+Q2)(Brodal) I/O Algorithms (2011, Q3+Q4) (Arge) Advanced PhD courses (by Post Docs) Advanced Computational Geometry (2008, Q4) Advanced Randomized Algorithms (2009, Q4) Advanced Range Searching (2010, Q3) I/O-Efficient Graph Algorithms (2010, Q3) Lower Bounds and Information Theory (2010, Q2) Algorithms and Data Structures – Courses? 5 Theoretical computer science –Assumptotic analysis Tool development –I/O algorithms (TPIE, TerraSTREAM) Algorithm engineering –primarily in relation to master thesis Seminars – students very welcome ! 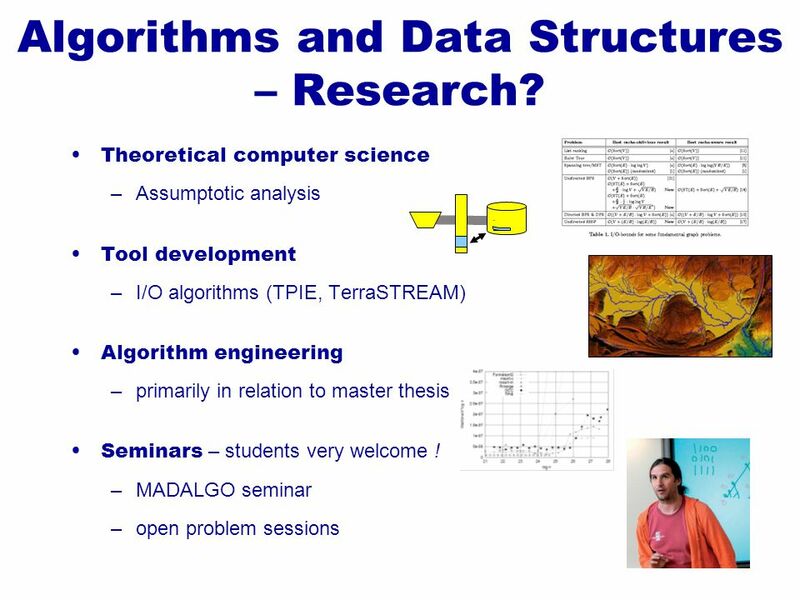 –MADALGO seminar –open problem sessions Algorithms and Data Structures – Research? 6 Solve a concrete practical problem …using algorithmic techniques Survey of a research area Implement a technical paper...fill in the missing details...perform experiments Explain all (missing) details in a technical pape r...how 8 pages become +100 pages Experimental comparison of algorithms The clever idea: A new algorithm Examples : www.cs.au.dk/~gerth/cv/#Advising Algorithms and Data Structures – Types of Master Thesis? 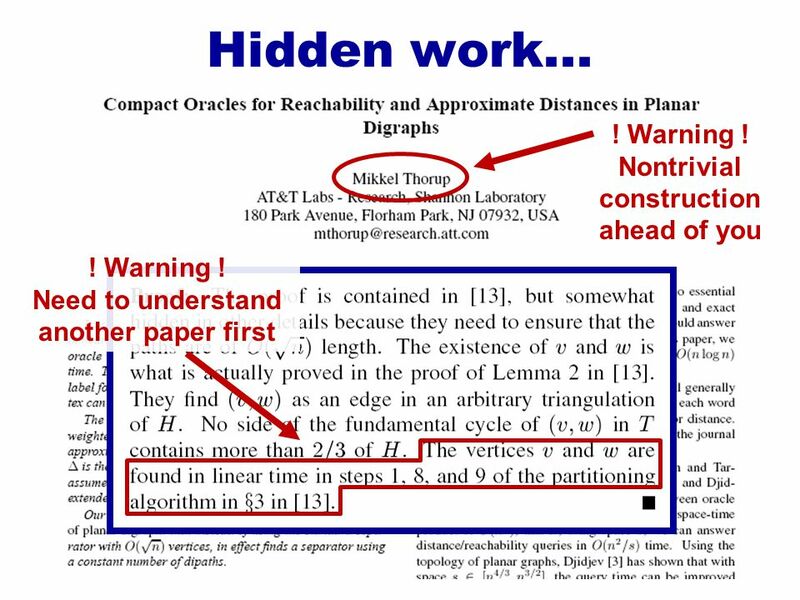 7 Large fraction of time spend on trying to understand technical complicated constructions Implementations are often an ”existence proof” – most algorithm authors do not implement their algorithms (did they ever think about the missing details?) 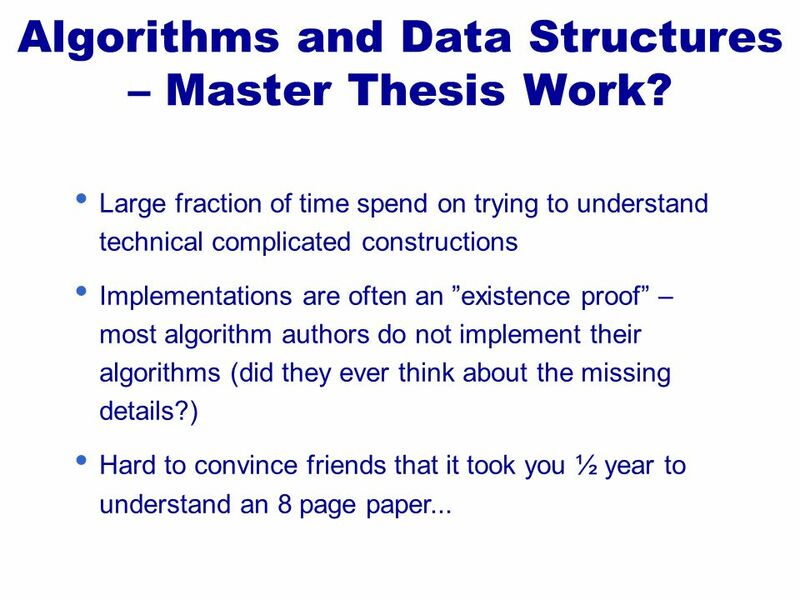 Hard to convince friends that it took you ½ year to understand an 8 page paper... Algorithms and Data Structures – Master Thesis Work? 8 David Kjær Range median algorithms Jonas Suhr Christensen Experimental study of kinetic geometric t-spanner algorithms Henrik B. Kirk Searching with dynamic optimality: In theory and practice Krzysztof Piatkowski Implementering og udvikling af maksimum delsum algoritmer Claus Andersen An optimal minimum spanning tree algorithm Jonas Maturana Larsen and Michael Nielsen En undersøgelse af algoritmer til løsning af generalized movers problem i 3D Algorithms and Data Structures – Master Thesis Examples? 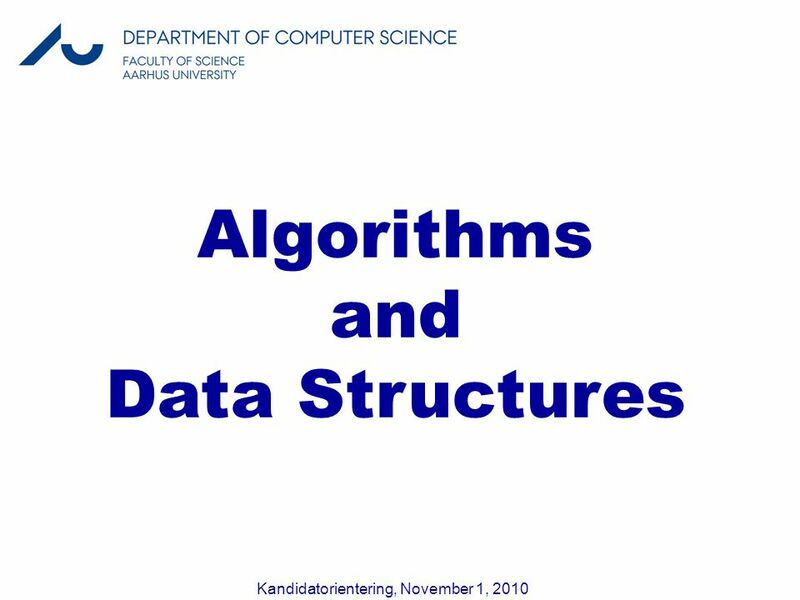 Download ppt "Kandidatorientering, November 1, 2010 Algorithms and Data Structures." 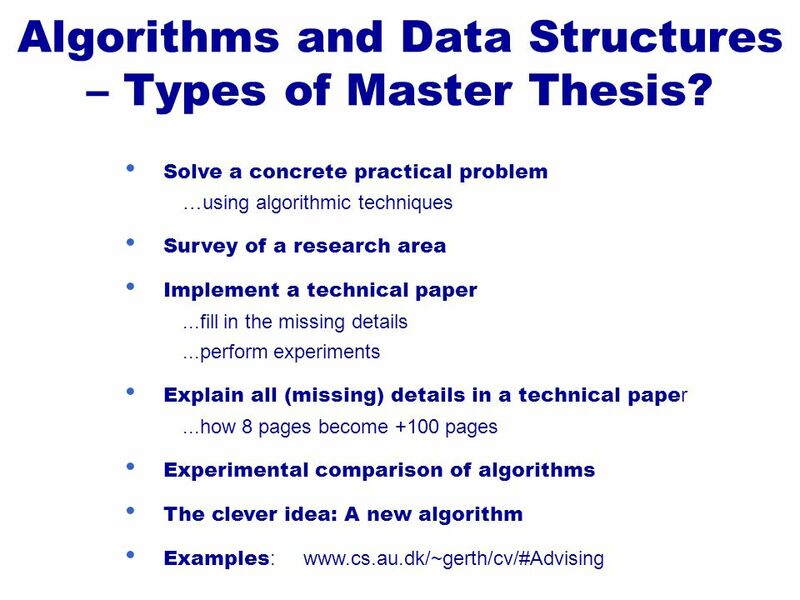 Master Thesis Algorithms. Algorithms – Who? Faculty Lars Arge Gerth Stølting Brodal Gudmund Skovbjerg Frandsen Kristoffer Arnsfelt Hansen Peter Bro Miltersen. Kandidatorientering, April 20, 2012 Algorithms and Data Structures. Lars Arge Gerth Stølting Brodal Algorithms and Data Structures Computer Science Day, Department of Computer Science, Aarhus University, May 31, 2013. 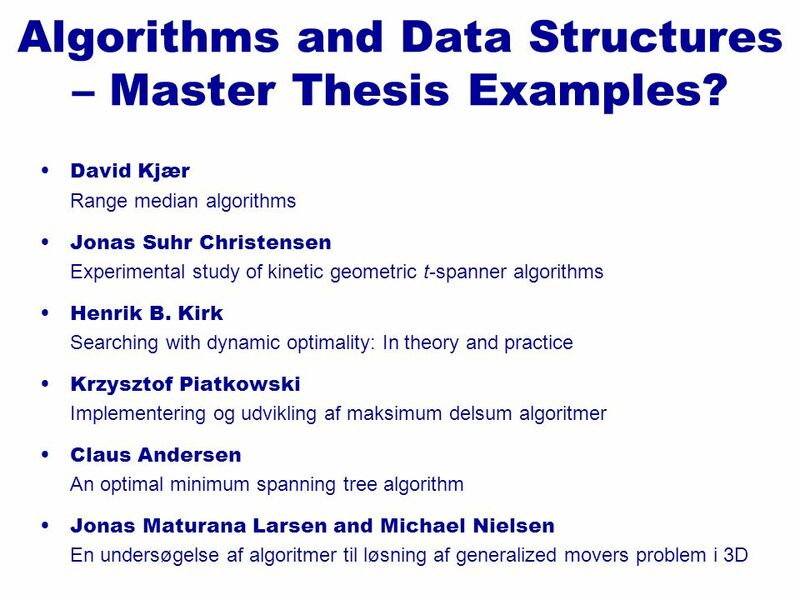 Master Thesis Preparation Algorithms Gerth Stølting Brodal. 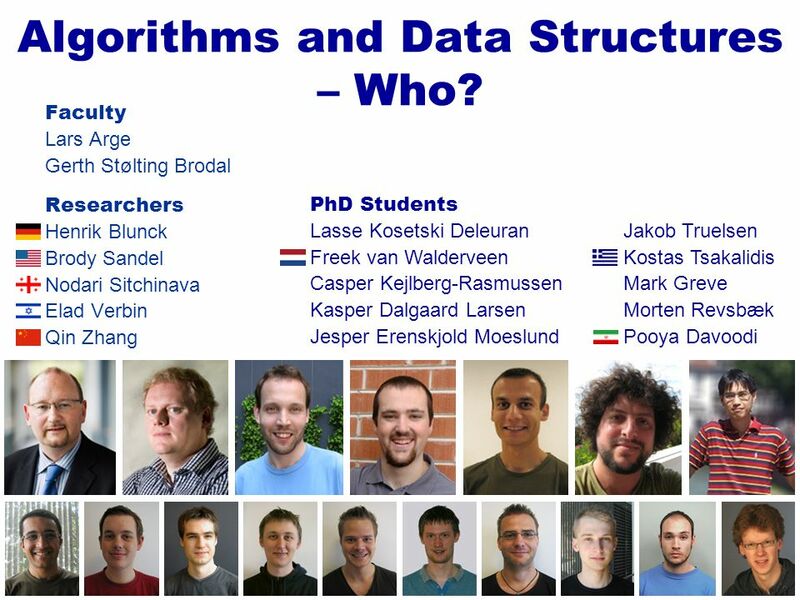 Algorithms and Data Structures Group Gerth Stølting Brodal Faculty Meeting, Department of Computer Science, Aarhus University, October 3, 2014. Lars Arge 1/43 Big Terrain Data Analysis Algorithms in the Field Workshop SoCG June 19, 2012 Lars Arge. 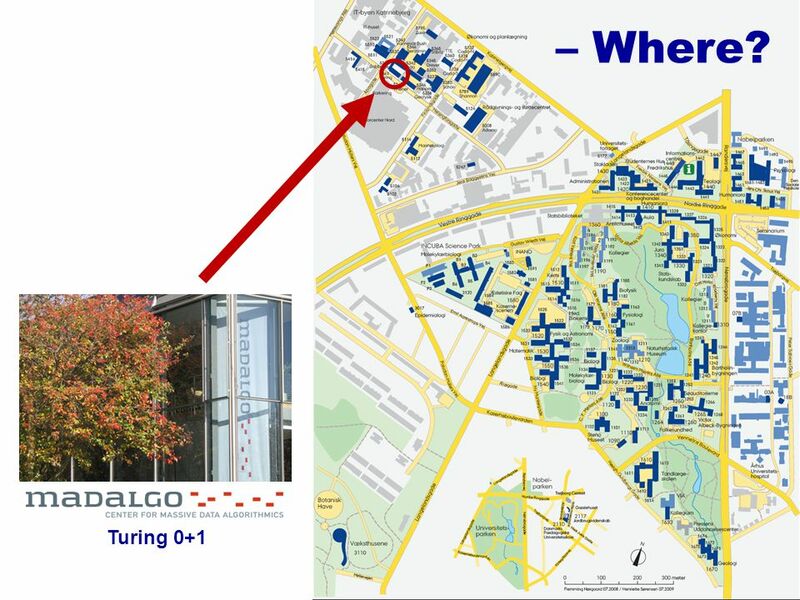 MADALGO ― Center for Massive Data Algorithmics MADALGO is a major new basic research center funded by The Danish National Research Foundation initially. Kandidatorientering, October 28, 2011 Algorithms and Data Structures. Randomized Algorithms Randomized Algorithms CS648 Lecture 15 Randomized Incremental Construction (building the background) Lecture 15 Randomized Incremental. S. J. Shyu Chap. 1 Introduction 1 The Design and Analysis of Algorithms Chapter 1 Introduction S. J. Shyu. Gerth Stølting Brodal Universitets-Samvirket Århus, Statsbiblioteket, Århus, November 16, 2010 Udfordringer ved håndtering af massive datamængder: Forskingen. UMass Lowell Computer Science Analysis of Algorithms Prof. Karen Daniels Fall, 2009 Lecture 1 Introduction/Overview Text: Chapters 1, 2 Th. 9/3/2009. HENRIK BÆRBAK CHRISTENSEN ASSOCIATE PROFESSOR AARHUS UNIVERSITY DEPARTMENT OF COMPUTER SCIENCE 1 Experimental Software Architecture Kandidat orientering. UMass Lowell Computer Science Analysis of Algorithms Prof. Karen Daniels Fall, 2005 Lecture 1 Introduction/Overview Text: Chapters 1, 2 Wed. 9/7/05. CES 592 Theory of Software Systems B. Ravikumar (Ravi) Office: 124 Darwin Hall.